In fact, ancient Stoicism itself underwent a number of changes that are well recorded in both primary and secondary texts. The early Stoics used a different approach and emphasis from the late ones, and there were unorthodox Stoics like Aristo of Chios (who was closer to Cynicism and rejected the importance of physics and logic in favor of ethics), Herillus of Carthage (who thought that knowledge was the goal of life), and Panaetius (who introduced some eclecticism in the doctrine). There were heretics who left the school, like Dionysius of Heraclea, who suffered from a painful eye infection and went Cyrenaic. Even within the mainstream, though, one gets fairly different, if obviously continuous, pictures of Stoicism moving from the early Stoa of Zeno and Chrysippus to the late Stoa of Seneca and Epictetus, with major differences even between the latter two. While an accessible scholarly treatment of this can be found in the excellent Cambridge Companion to the Stoics (especially chapters 1 and 2), I want to focus here on some obvious distinctions among the early Stoa, Seneca, and Epictetus, distinctions that I think both illustrate how Stoicism has always been an evolving philosophy, and provide inspiration to modern Stoics who may wish to practice different “flavors” of the philosophy, depending on their personal inclinations and circumstances. The major sources we have about the philosophy of the early Stoa, from the founding of the school by Zeno of Citium circa 300 BCE to when Panaetius (who is considered to belong to the middle Stoa) moved to Rome around 138 BCE, are Diogenes Laertius’ Lives and Opinions of the Eminent Philosophers, and a number of Stoic-influenced works by Cicero. This changed in the late Stoa, as we shall see, when physics and logic were largely (though not completely) set aside, in favor of the ethics. But for the early Stoics, a reasonable understanding (logic) of how the world works (physics) lead to the famous Stoic motto: live according to nature. And how did they define the virtues? That is why I devoted an entire section of this blog to the exploration of role models, both ancient and modern. They are a great practical tool not just because they provide us with examples of ethical behavior to use as inspiration and to do our best to imitate, but also because our very choices of role models tell us a lot about our values and help us reflect on them. As Liz Gloyn has commented in her The Ethics of the Family in Seneca, one can read the 124 letters to Lucilius as a bona fide Stoic curriculum, and it does not look at all like something Zeno or Chrysippus would have used. One gets a distinctive impression that Seneca has decidedly moved away from theory and into pragmatics, which foreshadows, of course, the great late innovator of Stoicism, Epictetus. Among modern Stoics Epictetus is most famous for his clear statement of the dichotomy of control (see Enchiridion I.1), which with him becomes a dominant component of Stoic philosophy, and which underlies his famous three disciplines: desire, action, and assent. The dichotomy of control, the all-important distinction between what is in our power (our values and judgments) and what is not in our power (everything else) is an application of the virtue of practical wisdom, to which Cicero above referred to as the knowledge of things that are truly good or bad for us. It is most directly connected to the discipline of desire, which trains us to desire what is proper (i.e., what is under our control) and not what is improper (what is not under our control), but it really underlies all three Epictetian disciplines. This, according to Johnson, is a sophisticated elaboration of and advancement upon Panaetius’ four personae, a theory used by Cicero in the first volume of De Officiis: our universal nature as rational agents; what we can be by way of our natural dispositions; what we are as a result of external circumstances; and the lifestyle and vocation we choose. This is why Brian disagrees with the famous — and widely accepted in modern Stoic circles — notion proposed by Pierre Hadot of a tight relationship among the three disciplines of Epictetus, the classical four virtues, and the three fields of inquiry (physics, logic, and ethics). I summarized Hadot’s approach here (see especially the diagram accompanying the post), but the more I think about it the more it seems both too neat and too strained. Too neat because it seeks to make coherent sense of different ideas that were deployed by the Stoics in a different manner when teaching five centuries apart from each other; and too strained because there just isn’t any good way to make things fit given that there is precious little evidence that Epictetus was thinking about the four virtues (or even the three fields of inquiry) when he articulated his three disciplines. I want to stress that the implication is most definitely not that later iterations are better than early ones. “Evolution” here simply means what the root of the word indicates: change over time. In fact, I think these three approaches are different ways of interpreting the same basic Stoic philosophy, by putting the emphasis in different places as a function of the style of the teacher and the audience of students one is addressing. Ancient Athens was culturally distinct from imperial Rome, and Seneca definitely had a distinct temperament compared to Epictetus. 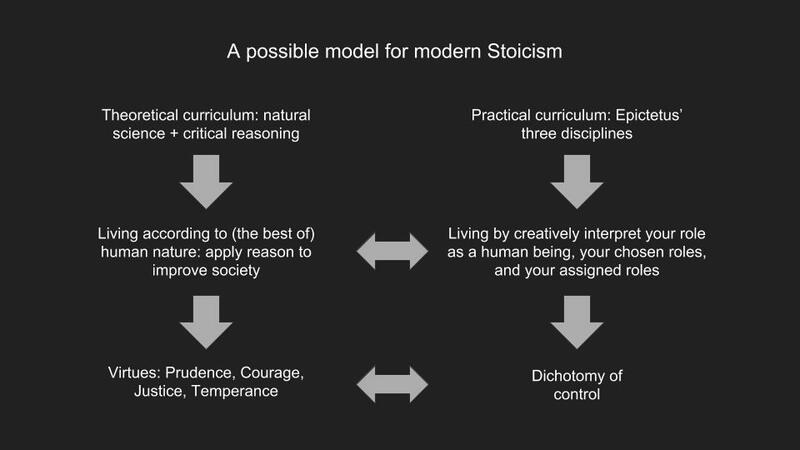 What does it all mean for modern students of Stoicism? The next slides is my own attempt at reorganizing the same material in a way that makes sense for contemporary audiences and could serve as the basis for a curriculum in modern Stoicism. To begin with, notice the distinction between a theoretical and a practical approach (first row). Both should be deployed, as Stoicism is not just a bag of tricks, it is a coherent philosophy of life. A modern Stoic would be well served from learning the basics of natural science, developing a grasp of our best ideas about how the world actually works, so to avoid as much as possible buying into questionable views of reality. She should also acquire basic training in critical reasoning, so to be able to distinguish sense from nonsense and arrive at the best possible judgments in her life. The idea is the same one informing the ancient notion that in order to live a good life one has to appreciate how the cosmos is put together and has to be able to reason correctly about it. 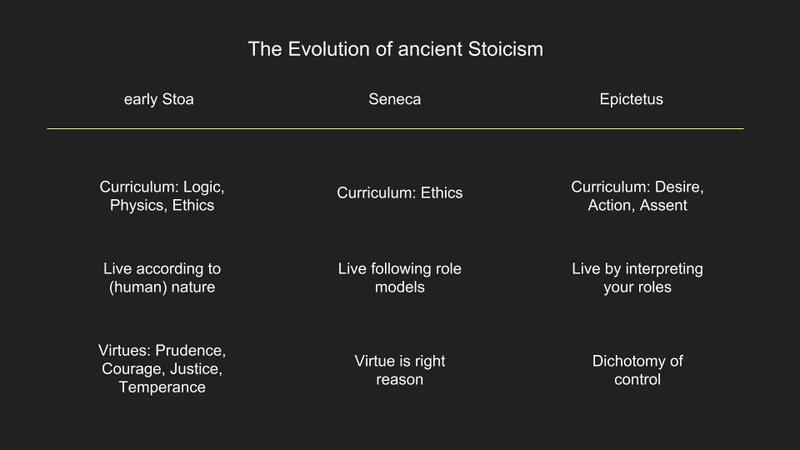 The practical counterpart of the curriculum could be based on the Epictetian disciplines, which still provide a useful framework to actually practice Stoic philosophy, especially when tackled in the sequence envisioned by Epictetus. We still need to get better at redirecting our desires away from things that is improper (Stoically speaking) to want and toward things that is proper to want. The next step is to put our newly acquired practical knowledge into action, by behaving properly in the world, which largely means treating others justly and fairly. Finally, for the advanced students (as Epictetus suggested), we can refine our practice by paying careful attention to what exactly we should or should not give assent. The final row in the slide recovers a theoretical role for the classical cardinal virtues of prudence, courage, justice, and temperance, because I find them useful in order to provide a general framework for thinking about how we ought to behave. The practical counterpart is Epictetus’ dichotomy of control: every time we remind ourselves that some things are up to us and others are not, we then have to decide how to act on the first set and how to best ignore the second set. And our moral compass is provided by, you guessed it, the four virtues. 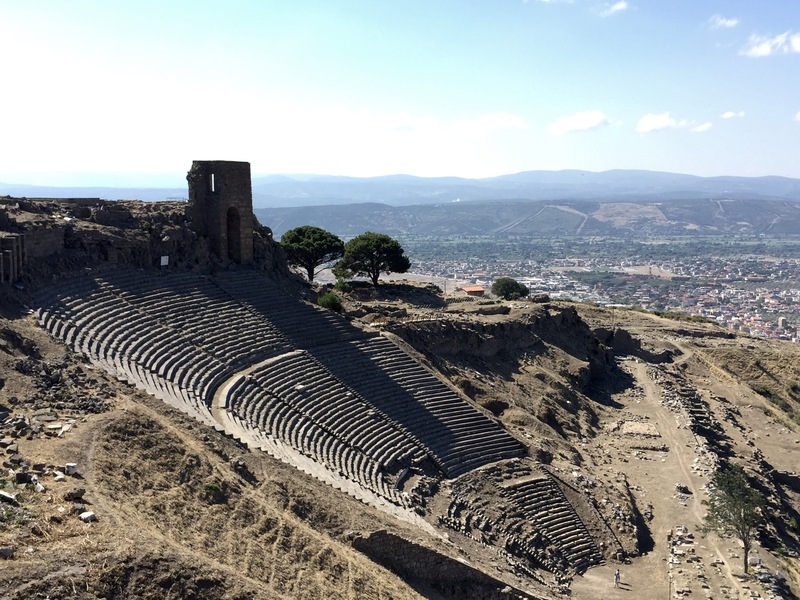 This entry was posted in Ancient Stoicism, Modern Stoicism on July 5, 2018 by Massimo. In today’s world with an overflow of information, I believe the process of learning natural sciences is dependent upon critical reasoning. Critical reasoning like the beacon on our journey; without it, we’d be swimming aimlessly in a sea of information. glad you liked the essay. Requests are welcome! I have actually been thinking about writing on Scipio, who was one of my favorite characters from Roman history, back in elementary school! I’ll look for more material on him, stay tuned. I think of the ancient Stoics as presenting a research programme – in psychology as least, a very successful one. For example, Ellis et al’s CBT and recently Paul Bloom – for example in ‘Just Babies’ and ‘Empathy’ – (though the Stoics are not mentioned in Bloom). I just wanted to thank you for your recent on article on stoicism and feminism. (Unfortunately, I think comments on that one are closed now.) At your book’s recommendation, I’ve been reading Epictetus for the first time, and I found some of the casually-sexist remarks a bit offputting. As to the current article: I really liked the chapter in your book on ancient & modern Stoic role models (via Seneca’s emphasis on them). It’s not something that was addressed as specifically in other modern-Stoicism books I’ve read (such as Irvine’s). At least for me, following in the footsteps of someone who’s demonstrated virtue has been a really powerful way of improving myself. Those who criticize modern Stoicism as inauthentic seem to treat it as a forgery being offered as an old master painting, as if historical accuracy, as opposed to practical application, were the goal. Perhaps they do so because the deontological ethics of monotheism has come to stand, in the popular conception, for ethics as a whole. Thank you for this article. I am new to Stoicism (although I will stay with it for the rest of my life-it has been a joy to discover) and find your articles all very insightful, however I particularly enjoy the clarity of how things compare and line up articulated in this post. Thank you also for your most recent book. I read it almost straight through in two days and am now re-reading it to get the concepts to sink in further. While I am a novice at the study of classical philosophy, I have found a home with Epictetus and the Dichotomy of conrol. It will greatly help me during faculty meetings at my university this coming year! (I trust you know what I am talking about). Nice essay too, where stoicism, in the end, doesn’t seem significantly different from what modern no nonsense philosophy should be. Overall, for me, stoicism was a philosophy made to go hand in hand with dictatorships: all stoic philosophers, think of it, operated under dictatorship. Had I been a dictator, like the Macedonians, I would have looked to the stoa mildly… Whereas Antipater and others wanted Demosthenes to die under torture. Were I Domitian, who expressed his hatred of philosophers, and, with his ultra wealthy friends, celebrated how they controlled Rome, I would have looked at Epictetus teaching in a benign fashion: they made us believe virtue was possible in a lethal dictatorship where not toeing the one and only party line meant death. Do we need this now? Do we need to placidly contemplate and hone our own virtues while a few guys in charge prepare thermonuclear war, and civilization is under threat of imminent deconstruction? Or do we need passion, and start first with a feeling of rebellion, and proclaim that enough is enough? For me the later, passion. And enough with my virtues: they are plenty enough. What I need is a virtuous government for the planet, and that request doesn’t come from humility, but rebellion and bold assertion of myself, and my ilk, as a role model! I get your point. When facing oppression, many would choose to fight back passionately for what they believe in. The famous Stoic role model, Cato the younger, did just that, but without passion. I doubt Julius Caesar looked to him mildly. I would offer that in my opinion, passion and virtue can co-exist and are not mutually exclusive. The reason I am gratified by Stoicism is that, for me, it offers a way to see more clearly those things that are within my circle of influence and those that are not. Unfortunately, I spent far too many years trying to fix things that were not under my power to fix. This is a quick prescription for insanity. I have found it far more efficacious to focus on how I could contribute to “a cause” while maintaining an awareness of the limitations of what I can do as a lone individual. I am not suggesting that passion is not valuable, necessary, and indeed a powerful motivator, however, how one focuses that passion can make a big difference in the outcome of any situation. I have found more success when I stopped banging my head against the brick wall and instead searched for the locked door—that was within my control to pry off the lock. Another take on CBT is by Byron Katie, who refers to her process as ‘The Work.’ It focuses primarily on taking ownership of our thoughts and on staying in our ‘own business’ rather than trying to control the ‘business’ of others. She believes that we only suffer (get anxious, depressed, angry, indignant, etc.) when we are in someone else’s business. As a 60-year-old gay man who only recently was allowed to legally marry my spouse of 32 years, I am no stranger to “passion and rebellion.” I have discovered that the calm, steady, and virtuous approach to dramatically changing a culture wins over more opponents than angrily waving my fist in their faces. The Stoics operated under a number of different types of government in Athens, Rhodes, Alexandria, Rome, and so forth. And yet Domitian kicked Epictetus and all the Stoics out of Rome, precisely because he did not like their criticism of the regime. Several Stoics were sent into exile or killed by Nero, Vespasian and Domitian. Definitely not benign. Do we need this now? Do we need to placidly contemplate and hone our own virtues while a few guys in charge prepare thermonuclear war, and civilization is under threat of imminent deconstruction? You seem to have entirely forgotten the virtue of justice, and the discipline of action. As always, yet another practical and invigorating essay on Modern Stoicism. Thanks! I am going to think carefully about the kind and penetrating comments above. The difference between Cato and Caesar was striking. Neither Caesar nor me can understand what Cato tried to demonstrate. Caesar was very practical: he had to subdue Persians and Germans, everything else was secondary. Caesar thought his own logic impervious, it never came to his mind the assassins could be that enraged. Imagine that there were some fragmentary records describing the ship of Theseus — maybe a picture, or even an actual plan. If, after doing some research, I were to build a ship inspired by (but not strictly following) these records, would I be justified in claiming that it is the same ship that was owned by Theseus? Is there any value in my making this claim? What if several modern people all did this, updating different elements in different ways, some closer to the original than others? Would they all be the same ship that was owned by Theseus? My unease is not related to the worth of the philosophies of modern people inspired by Stoicism, any more than claims about having the ship of Theseus are related to the seaworthiness of the vessel. Some alterations to Stoicism I admire, and think are significant improvements; others have removed or altered elements I find important and insightful; and yet others I strongly disagree with. I am more interested in the usefulness of the term “Stoic” as a label: what do I want to find if I google “Stoicism”, or buy a book on Stoicism? If I tell someone I have an interest in Stoicism, will they jump to incorrect conclusions based on the information they are most likely to be familiar with? I like Shaftesbury’s example. He was clearly strongly influenced by Stoicism, but not reluctant to differ with his Stoic influences, and never actually claimed to be describing Stoicism. I also like Becker’s approach, as he makes it very clear what he is up to — even in the title of his book. In practice, blogs by you and Robertson and many others do not seem at all problematic to me either. Where they differ, what is historical Stoicism and what are your own views is clear. You have your own ships. They are similar to the ship of Theseus. But, when you are talking about ships, it isn’t unclear which you are referring to. This is not true of everybody, however. The association between CBT (cognitive behavioral therapy) and stoicism sends up a caution signal for me. Many years ago, I was struck by Alan Watts’s assertion that Eastern religions corresponded closely with what we Occidentals think of as therapy, i.e. methods or practices designed to alleviate mental illnesses. In the course of time, I came to feel that this often entailed, in many respects, the substitution of one kind of religion for another, involving the replacement of the priesthood by the therapeutic profession. But as I’ve gotten to know a little about Stoicism, in its ancient and modern forms, I don’t see anything like this process, and the recommendation of finding virtuous role models seems utterly different from the doctor/patient relationships generally found in psychotherapy. Stoicism seems more like a kind of hands-on form of philosophy, whose practical goals of self-healing are quite different from what most of us have come to expect from western philosophy. Not sure Cato was trying to demonstrate anything. It came down to this: Cato thought Caesar would spell the end of the Republic (which he did), and he was opposed to it. So he took up arms and fought against him. Another example of Stoics not laying down quietly to contemplate their own virtue. If I tell someone I have an interest in Stoicism, will they jump to incorrect conclusions based on the information they are most likely to be familiar with? Possibly, but their opinion is not under your control. If you think it helps, you can explain why they are mistaken to them and then move on with your own practice. I don’t see anything wrong with describing Stoicism on the basis of what we know. Could we be wrong? Of course. But that can be said of pretty much every human enterprise. As for “is this Stoicism?,” well, I do think there are certain core commitments that if one rejects then one is not doing Stoicism, but ultimately “Stoicism” is a family resemblance concept, rooted in certain texts, people and ideas that flourished between the third century BCE and the second century of the modern era. It’s good enough for most purposes. I found Stoicism largely due to the failure of the therapists who were supposed to help me through postnatal depression. It wasn’t their fault – our case was a bit more complicated than usual. The last therapist was seriously concerned about my suicidal tendency so she repetitively said to me :”please don’t hesitate to call if you need to!” However, I often needed to call while lying awake at 3 in the morning, when no one would be available to answer. It was then I accidentally stumble upon Stoicism – a hands-on philosophy one can apply to every ordinary event in life. A therapist would charge you some money and help you for an hour at a time, but philosophy can be with you 24-7. It does not rest. Cato extracted his own bowels with his own hand. To prevent his physician to put them back in place and sew the wound, Cato pierced his intestines. Such hatred! All this because he was afraid that Caesar would pardon him! Most of those who would assassinate Caesar had been pardoned by him previously, and, clearly Caesar intended to pardon Pompey, Pompeius Magnus, too (Pompey was assassinated by some Egyptians, and Caesar was furious he was deprived of the pleasure of pardoning him). It is NOT clear that Caesar intended to finish the Republic: Caesar’s plans were only strategic. Why did Caesar enter the Senate unarmed and unaccompanied? It never came to Caesar’s mind that, after treating, and teaching his enemies so well, they would still hate to that level (the Cato bowel incident should have warned him of the intensity of jealous rage he was facing). Paradoxically, Caesar was the stoic one! What Caesar thought, clearly is that the Persian and German threats had to be terminated, or Rome would not survive. He was right. That turned out to be absolutely true. Within two centuries of Caesar’s assassination the German situation had run completely out of control, in spite of the excellent military and strategic efforts of Trajan and Marcus Aurelius. Trajan conquered Dacia, to act as a buffer. Marcus Aurelius would spend his entire rule desperately fighting the Germans, who threatened to reach Italy. Marcus intended to go on with the war, it is Commodus who gave up, because he prefered to play in Rome. However, within a generation, a Roman emperor and his son, and an entire Roman field army, would be annihilated by invading Germans, and the Roman empire would careen out of control, under relentless pressure from invading Germans. In the Orient, the Persians kept on attacking Rome and her allies (especially the Armenians). This went on until the Seventh Century. Rome won, Persia fell apart, but was exhausted, and this is exactly why Muhammad personally attacked. Meanwhile the Franks took Caesar’s advice seriously, and conquered all of Europe, shortening the frontier, insuring that (differently from India and China) Europe would not be conquered for the next 15 centuries. Cato’s enthusiastic stretching of his bowels was militarily unwise: Caesar was a conqueror, but not so much of tyrannical power within Rome, but through the world. The probability that Caesar would survive years of battles, conquering Persia, then going north through the Caucasus, and then catching all of Germania from behind, was low. In that perspective the “dictator for life” title of Caesar made sense: dictators had been named for 6 months, but that was for operations within Italy. Caesar, paradoxically, was assassinated just as he was going to embark for the attack against the enemies of Greco-Roman civilization. A furious, now headless army would make sure that didn’t happen again (hence the bloody revolution under Augustus, establishing a tyranny). It would have been wiser for Cato to get his pardon, and man the ship of state in Rome while Caesar and the best army Rome ever had tried to solve the Persian and German problems, in the only way which could work: extending the Pax Romana there. By the way China did exactly the same then, going all the way to the Caspian, and that made China unconquered for centuries. The two empires would have been neighbors in contact. Stoicism seems to be a philosophy preoccupied by the self. It is not clear that it can apply to civilization. To keep on going, more than ever, civilization needs passion, elan. Civilization cannot stand still, it needs dynamics, not static stoicism. Debating with Caesar was the way to go. And it was strategic to let him go thousands of miles finish what Alexander couldn’t do. And virtuous for civilization. this isn’t really a discussion about the value of Stoicism in general, which is not the point of the OP, so I’m going to make one last comment and suggest we move on. Cato extracted his own bowels with his own hand. To prevent his physician to put them back in place and sew the wound, Cato pierced his intestines. Such hatred! Why do you impute hatred to him? His motivation was very clear: he did not want to be used by Caesar as a political pawn, and he chose what he thought was the honorable way out. Again, you are inferring motives on little evidentiary basis. What is clear is that Caesar had taken the unprecedented step of declaring war on the Senate. And Cato, like several others, saw clearly where this was going: monarchy (i.e., empire). They were right, and they reacted according to their principles. Neither of those statements is historically correct. Nor is your statement that the empire was invaded within one generation. This went on until the Seventh Century. Rome won, Persia fell apart, but was exhausted, and this is exactly why Muhammad personally attacked. By the 7th century Rome was long gone. Stoicism seems to be a philosophy preoccupied by the self. It is not clear that it can apply to civilization. Please read any of the entries in this blog about the virtue of justice or the discipline of action and you will know that your assessment is way off the mark. It is a common misconception to think that Stoicism is about suppressing (positive) emotions. See my series on Margaret Graver’s book. … “Stoicism” is a family resemblance concept, rooted in certain texts, people and ideas that flourished between the third century BCE and the second century of the modern era. It’s good enough for most purposes. If the references for the family resemblance remain the “ideas that flourished between the third century BCE and the second century of the modern era”, then I agree that that seems like a “good enough for most purposes” use of the word. What I object to more (and see more often in arguments about “updating” Stoicism) are movements of the reference points. One example is the claim (citing Irvine) that although virtue used to be an important part of Stoicism, it isn’t any more. If objections are raised using references to Seneca at al., they are dismissed merely as describing how Stoicism used to be. I raise the point more in response to the general statement at the beginning of your post (about Stoicism evolving with time) than any actual specific examples in your descriptions of Stoicism. You make it clear, for example, that your “curriculum for modern Stoicism” presented later in the post still uses the classical sources as reference points — it doesn’t seem to me to be an attempt to actually change what Stoicism is — and so is not the object of my argument. so the general principle that a philosophy can, does, and arguably should change over time seems to me hard to reject. But you are right, the devil is in the details. Every substantive change needs to be argued for. And I completely disagree with Irvine’s proposal. Don Robertson and I think of Bill as more eclectic (with Epicurean tendencies) than Stoic.